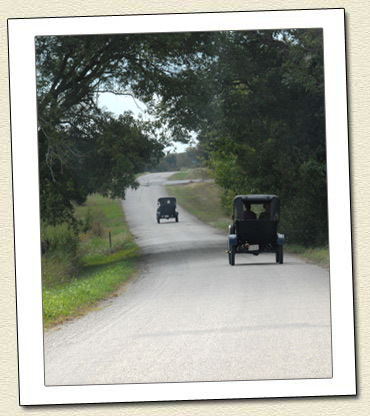 CONTACT US ABOUT MODEL T RELATED QUESTIONS. Do you need more information about the Cen-Tex Tin Lizzies Model T Ford Club of Austin, Texas? We can provide answers to your questions about membership, dues, fees, or Model T clubs in general. There are several ways to contact us. Click your mouse over the two cars in the image. As our name indicates, our club is located in the central Texas area, but we have members from all over Texas. If you have a passion for automotive history and in particular, a love for the Model T Ford, we invite you to join our club! Our annual membership dues are $15 for you and your family and should be paid by January 1 of each year. You do not need to own a Model T to become a member! Please print the form below and mail it to the address listed, along with a check payable to the Cen-Tex Tin Lizzies.